All Millennium Sunday teams are being asked to please help with field preparations for tomorrow's games, if we receive heavy overnight rain - whether or not your team is scheduled as a home or away team. If you are a player in the league - please notify your coach to read this post. If your team does not help with preparing the fields to play on and the games cannot be played - it will be noted along with the possibility of forfeit. The cooperation of all the teams will help with getting the games started on time. 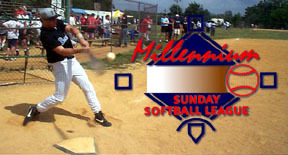 Note: Because there is a threat for rain to move into our area in the afternoon - I am asking the teams who are scheduled to play 1:00 p.m. doubleheaders to follow the rule that is used in Millennium Sunday Fall to help speed up the games. a) Three warm-up pitches to start a game, after which at the beginning of each ½ inning, no more than one warm-up pitch. b) No infield or outfield warm-up ball after the first inning. It may end up being a task to get some of the fields ready if we get the downpours overnight - but the only chance the league has of getting these games played if every team gets to their field early enough to work on them and let me know ASAP by email at millpres2000@verizon.net of the field conditions - in case I need to move games to another field. Please remember to bring push brooms, squeegees and rakes to the fields.